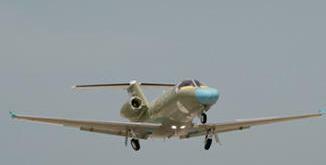 August 26, 2013 - On Friday Cessna Aircraft celebrated as the first production unit of its newest business jet, the Citation M2, took its maiden flight out of the company’s Independence, Kan., facility. The M2 was announced back in September of 2011 with a design driven by customer and pilot feedback. It is the latest in a succession of new Cessna aircraft to make its initial production flight, and type certification is expected this fall. “The aircraft performed exceptionally well today. We departed Independence and proceeded to an altitude of 17,500 feet. Through the almost two hour flight, we completed a large portion of the production test flight procedures” said Cessna production flight test pilot Terry Martindale. “This is the first aircraft equipped with the Garmin G3000 avionics, and the system goes beyond what people might be expecting in terms of familiarity, versatility, situational awareness and ease of use. You can sense that pilots designed the cockpit. Everything is where you need it to be.” The co-pilot on the mission was Cessna engineering test pilot Corey Eckhart. “When we announced the M2 less than two years ago, we knew a need existed for a jet of this size, capability and value. You will see operator feedback and owner insight practically everywhere you look in the M2. The Garmin G3000 avionics are familiar to pilots while at the same time bring advances they want with features they need. The M2 is the leader in the next generation of aircraft, and a great step ahead for any light jet operator who needs a new, more advanced business aircraft” said Brad Thress, Cessna senior vice president of business jets. The Citation M2 is the ideal aircraft to economically fly up to six passengers in comfort on a 1,300 nautical mile flight. The Cessna Intrinzic flight deck has Garmin G3000 avionics featuring high-resolution multifunction displays and split-screen capability. Touch screen interactivity comparable to a Smartphone provides pilots with precise performance information they need in a logical, familiar user interface. “The flight of the M2 today is the latest demonstration of our deeply-held commitment to product development,” said Thress. “The Citation X took its first production flight this month, and the Citation Sovereign took its first production flight in April. Cessna has put over 3,300 flight hours into the M2, the Sovereign and the Citation X programs. We are dedicated to bringing these jets to our customers, and dedicated to delivering what our customers want. The Citation M2 features two powerful Williams FJ44 engines and a cruising speed of up to 400 ktas (460 mph). The M2 has the range to fly passengers nonstop from Houston, Texas to New York, N.Y., Calgary, Alberta to Chicago, Ill., or San Diego, Calif., to Mexico City, Mexico. The M2 can climb to a flight level of 41,000 feet in 24 minutes, is single pilot certified and has a useful load of 3,809 lbs.